The Volkswagen Beetle, the Type 1, is a two-door, rear-engine subcompact economy car for up to five people produced from 1938 to 2003. One of the most influential and iconic car designs in history, the Volkswagen Beetle provided an economical and simple car that could be mass-produced. The Volkswagen Beetle Type 1 concept would be updated for later generations in 1997 with the introduction of the Volkswagen New Beetle which draws heavily on the forms of the Type 1. 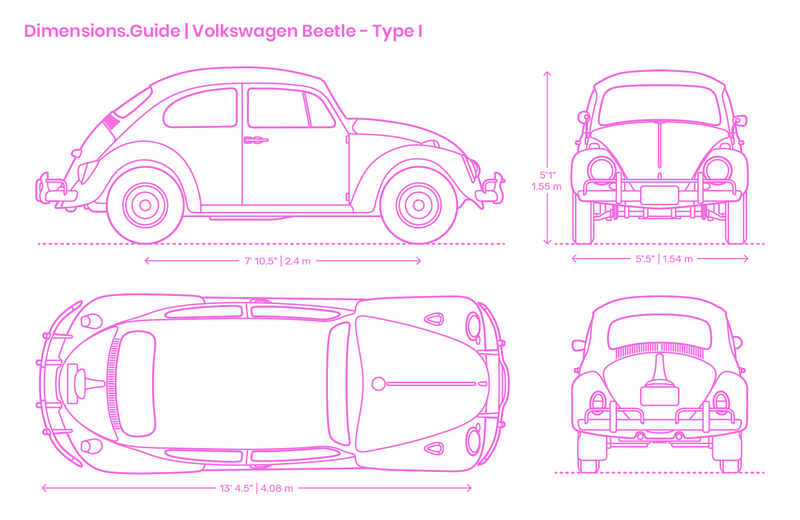 The Volkswagen Beetle Type 1 has a length of 13’ 4.5” | 4.08 m, wheelbase of 7’ 10.5” | 2.4 m, width of 5’ .5” | 1.54 m, and a height of 5’1” | 1.55 m.